Determining vertical dimension has remained a matter of clinical judgement. Many methods have been advocated for the same. This study was conducted to assess the reliability of conventional methods in obtaining the vertical dimension. The determined vertical dimension was verified using pre extraction cephalometric radiographs. 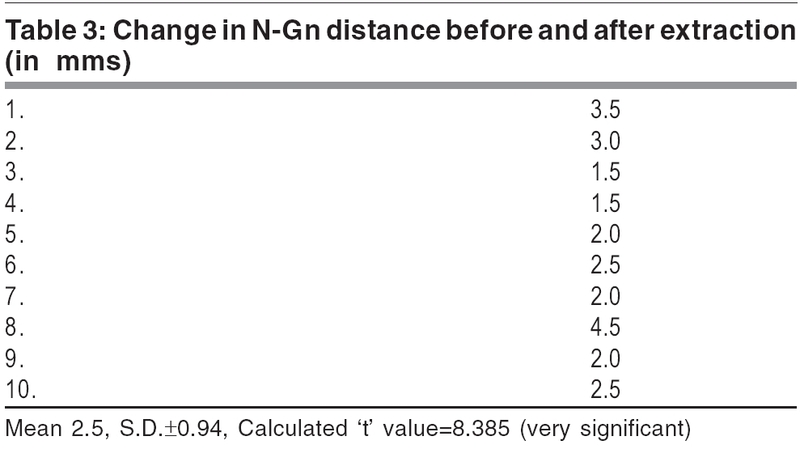 There was a decrease (-2.5 mm) in vertical dimension, which was statistically very significant. Middle face height showed the maximum reduction. Measurements from base of the nose to chin could be significantly correlated with cephalometric measurements. The conventional methods are not reliable to obtain the vertical dimension, which existed before extraction. It is generally agreed that one of the most important yet elusive step in complete denture construction is recording the correct vertical relation, as mastication, speech and appearance, all depend on vertical and horizontal relations of the mandible with the maxilla. Vertical relations are linked with horizontal relation, in so far as the ultimate success or failure of the denture depends on proper registration of both. A variety of techniques have been proposed to determine measurements for the correct vertical dimension of occlusion. When selecting the best method to use, the criteria to be considered are accuracy and repeatability of the measurement, adaptability of the technique, type and complexity of the equipment needed and the length of the time required to secure the measurement. Each method has its limitations. 1. To assess the reliability of the conventional methods in obtaining vertical dimension. 2. 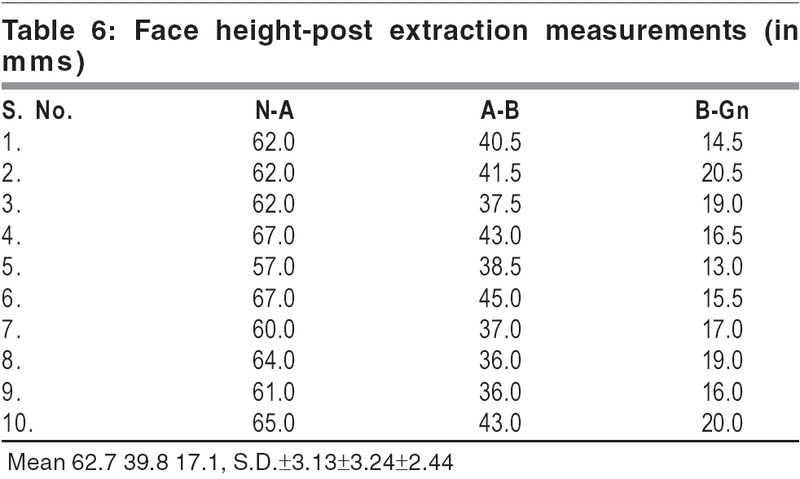 To analyse changes in morphologic face height after extraction. 3. To assess the reliability of measuring base of nose to chin distance in obtaining vertical dimensions. A total number of 10 patients who would require total extraction, were selected as subjects for the study. The patients were having sufficient anterior and posterior teeth, which could maintain vertical dimension. Their ages ranged from 32 to 60 years. Three were men and seven were women. Ethical clearance was obtained from the ethical committee, prior to the commencement of the study. In all of the patients taken up for the study, remaining teeth were removed either due to caries beyond repair, or periodontal disease. The armamentarium used for the study was divider, metallic scale, vernier callipers and marking pencil [Figure - 1]. Since facial relations after extraction and vertical dimension determination were to be compared with facial relations prior to extraction of teeth, subjects having many teeth in occlusal relationship with opposing teeth were preferably selected. No person with appreciable decrease in vertical relation due to loss of many teeth was accepted for the study. Records were obtained; diagnostic casts were prepared with alginate impression material. Profile and frontal photos were taken [Figure - 2]. The patients were asked to bite lightly on the posterior teeth and the distance between the base of the nose and chin was measured with the help of vernier calipers. The tip of the caliper was modified to fit the base of the nose. The caliper was placed parallel to the long axis of face and was held passively against the tissues when the distance was recorded. Lateral Cephalogram were taken on Panex - C (J. Morita) using ultraspeed 8" x 10" X-ray film, at a target distance of 5 feet from the X-ray tube using 80 KVP, 15 milliampere and 2.5 seconds exposure. Lateral cephalograms were made with teeth in occlusion to give the vertical dimension of occlusion [Figure - 3]. The cephalometric points and planes considered was Nasion (N), Gnathion (Gn), Point A, Point B, Pogonion and Mandibular plane. The total face height was obtained as the linear measurement between Nasion and Gnathion. ·The upper face height was measured between Nasion and point A. ·The middle face height was measured between point A and point B. ·The lower face height was measured between point B and Gnathion. A metallic scale calibrated to 0.5 mm was used throughout the study to obtain measurements.The cephalometric points and measurements were cross-checked under illumination to prevent errors. After the pre extraction records were obtained, extractions were carried out. A healing period of 3 months was allowed after the last extraction. Preliminary impressions were made in an impression compound and casts were poured with plaster of paris. Self-curing acrylic resin trays were prepared. Relief was given by using spacers. Border moulding was carried out using green stick compound. Corrective wash impression were taken using zinc oxide eugenol impression paste. (Impression paste, Dental products of India Ltd. Bombay). Stone models were poured after beading and boxing the impression. Permanent record bases were fabricated with heat cure acrylic (Stellon Denture Material, DPI/Dentsply, Dental products of India Ltd. Bombay). Occlusal rims were built with wax on these record bases. Width of the rims was trimmed to allow normal space for the tongue. The vertical dimension was obtained using a combination of methods. Triangular pieces of adhesive tape were placed on the subject's nose and chin. The patients were asked to pronounce the letter 'M' twice or thrice and then asked to relax. Measurement was made between the points on the adhesive triangles, using divider and scale, to give the vertical dimension at rest [Figure - 4]. Then, the patient was asked to close lightly on the occlusal rims to get the vertical dimension at occlusion. If three successive trials gave a difference of 2-4 mm between the rest position and occlusal contact, the vertical dimension was accepted as the final value. This was also further verified by noting the closest speaking space. The patients were asked to pronounce words with sibilants like 'six', 'sixty six' and the amount of space between the rims were observed. The patients were engaged in conversation and the speaking space was observed. A minimum of 1 mm space was acceptable. Facial aesthetics was also observed. The patient was asked to assume rest position and the face was observed for signs of strained appearance or drooping lips. Another examiner verified the determined vertical dimension. The rims were sealed in centric relation at the acceptable vertical dimension and cooled thoroughly under running water. Measurement was taken from the base of the nose to the chin with calipers and also, lateral cephalograms were made with the occlusal rims placed in the mouth. Further processing was completed and denture insertion was done [Figure - 5]. All inserted dentures were clinically successful. 1. At pre extraction stage. 2. Post extraction, with occlusal rims. Results of the study are presented in [Table - 1][Table - 2][Table - 3][Table - 4][Table - 5][Table - 6][Table - 7]. 1. From the numerical calculations, it was found that there was a significant difference in vertical dimension of occlusion from pre extraction stage and the vertical dimension was lesser than the pre extraction stage.The decrease ranged from 1.5 to 4.5 mm with an average of 2.5 mm. 2. The change in vertical dimension when analyzed statistically, showed a high significance, P <0.001. Middle face showed the maximum amount of change. 4. 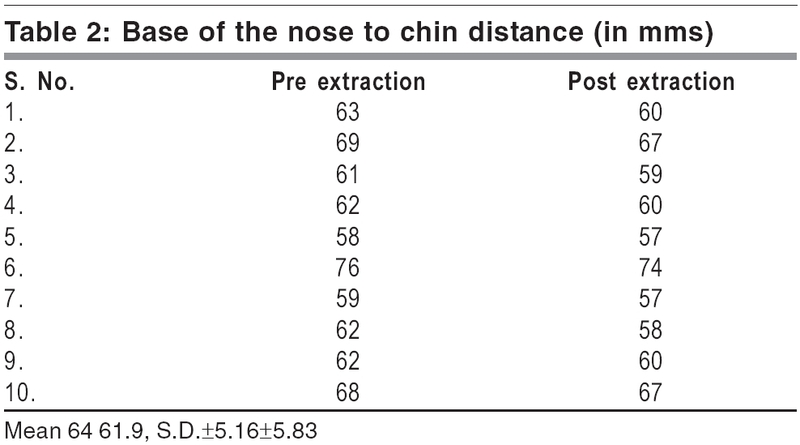 The base of nose - chin measurements after extraction, showed a definite decrease. It ranged from 1 to 4 mm with a mean of 2.1 mm. 5. 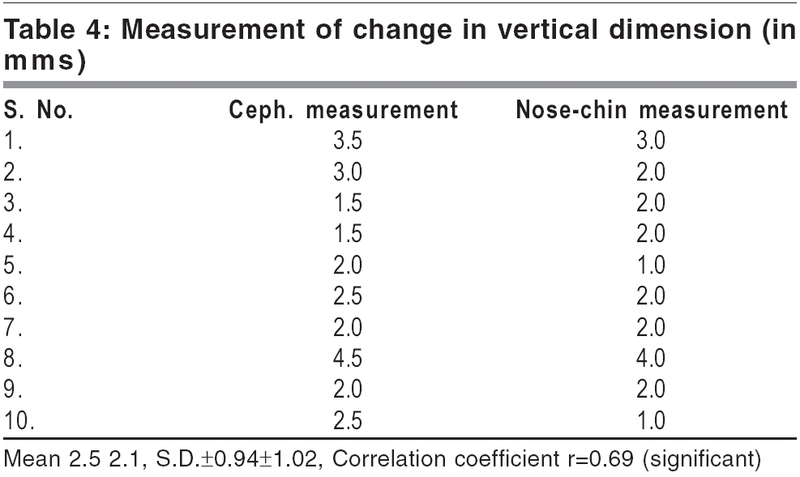 The changes in vertical dimension of occlusion as obtained by nose - chin measurements was compared with changes in cephalometric measurements It showed a significant co-relation, r = 0.69. Prosthodontists and dentists are continually confronted with problems related to the determination of vertical dimension. Even though many methods have been used, it has always been difficult to decide what should be the correct vertical dimension. It has been found that vertical dimension of occlusion in natural dentition is a constant, irrespective of the wear of the teeth. Many pre- extraction records like tattoo marks, cardboard profiles, special gauges and measurement of closest speaking space have been used to determine vertical dimension. Many authors,,,, have advocated the use of cephalometry in obtaining vertical dimension. In edentulous patients, when the dentist has no access to pre extraction records, he must resort to other methods to record vertical dimension. Considering the inaccuracies reported, with the use of trial bases, permanent record bases with wax occlusal rims were sealed and cooled thoroughly under running water to avoid distortion of wax. Cephalometry was done immediately. The conventional method was found to be the most popular, according to Swerdlow and Turrell. The point and gauge method of Pleasure has been in use for many years. The distance between the adhesive tape triangles placed on the nose and chin, on the midline of the patient, is recorded with a scale. The procedure is repeated a number of times, till a stable rest position are obtained. The vertical dimension of occlusion is determined by reducing 2-4 mm from the rest position. Satish Babu et al in their study, found out the difference between the methods varying between - 1.8 to 2.3 mm, but the mean value was not statistically significant. Facial esthetics gives a clue to the correct vertical dimension. Strained appearance indicates excessive vertical dimension, whereas compressed lips and too many folds around the mouth indicates reduced vertical dimension. Dale Smith found the pre extraction records to be reliable. He found a mean difference of 1.3 mm when the measurements were compared with cephalometric measurements. 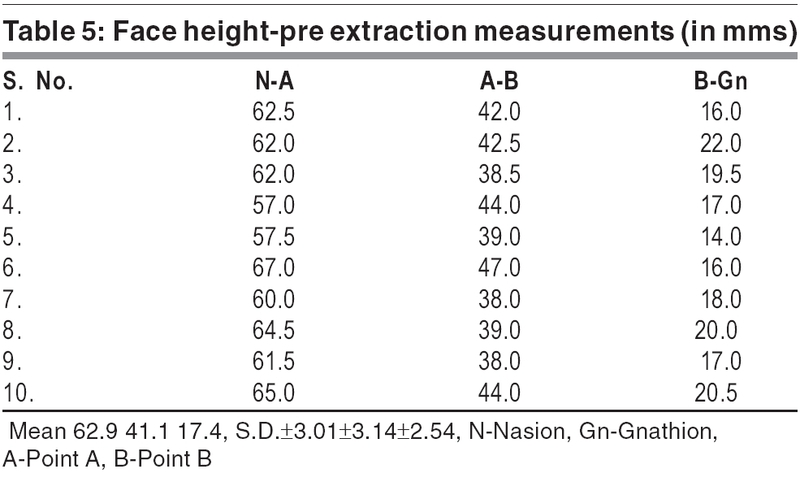 The accuracy of pre extraction record over a long period of edentulousness may be questionable. The clinical establishment of vertical dimension is based on the premise, that the vertical dimension of occlusion the patient had with natural teeth, is likely to be the best one for the new edentulous state and therefore should be reproduced. This premise has not been studied scientifically and remains an unproved assumption. If optimum vertical dimension for the edentulous state is different, the clinical establishment of vertical dimension may have to be re evaluated. It seems reasonable to accept the correct or physiologic vertical dimension of occlusion as a range instead of a fixed position. Viewed in this context, a value of 2.5 mm may fall within the range of physiologic vertical dimension. Determining vertical dimension of occlusion is one of the most important steps in fabricating a complete denture. 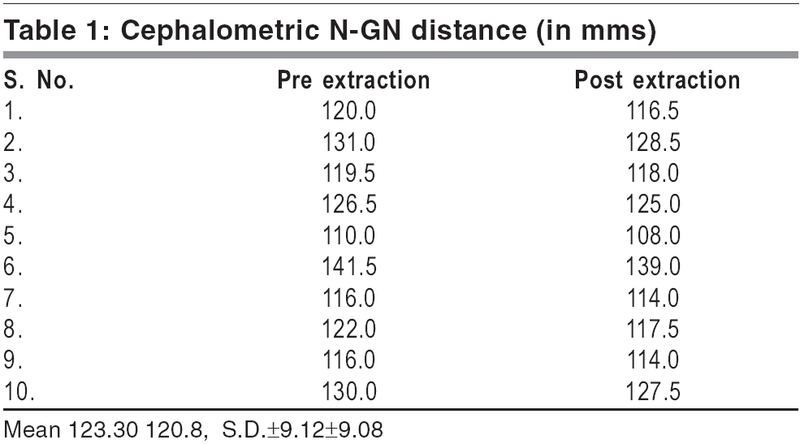 Nose-chin measurement has a significant co-relation with cephalometric measurements, hence it is found to be a very effective pre extraction aid in determining vertical dimension. However, reliability of pre extraction records in long period of edentulousness is limited. The conventional methods used to determine the vertical dimension are not reliable. Scientific methods to give an exact vertical dimension are yet to be evolved. Dawson PE. Evaluation, diagnosis and treatment of occlusal problems. 2nd ed, C.V Mosby Co: 1989. Atwood DA. A Cephalometric study of the clinical rest position of the mandible, Part I. The variability of the clinical rest position following the removal of occlusal contacts. J Prosthet Dent 1956;6:504-19. Duncan ET, Williams ST. Evaluation of rest position as a guide in prosthetic treatment. J Prosthet Dent 1960;10:643-50. Rickets RM. Role of cephalometrics in prosthetic diagnosis. J Prosthet Dent 1991;6:488-503. Perry HT. Application of cephalometric radiographs for prosthodontics. J Prosthet Dent 1974;31:254-61. Hull CA, Junghans JA. A cephalometric approach to establishing facial vertical dimension. J Prosthet Dent 1968;20:37-42. Brewer AA. Prosthodontic research in progress at the school of aerospace medicine. J Prosthet Dent 1963;13:49-69. Langer A. The validity of maxillo mandibular records made with trial and processed acrylic resin bases. J Prosthet Dent 1981;45:253-8,. Swerdlow H. Vertical dimension Literature Review. J Prosthet Dent 1965;15:241-7. Turrell AJ. Clinical assessment of vertical dimension. J Prosthet Dent 1972;28:238-46. Pleasure MA. Correct vertical dimension and free way space. J Am Dent Assoc 1951;43:160-3. Babu S, Singh S. Determination of vertical dimension of rest. A comparative study. J Prosthet Dent 1987;58:238-45. Smith DE. The reliability of pre extraction records for complete dentures. J Prosthet Dent 1971;25:592-608.